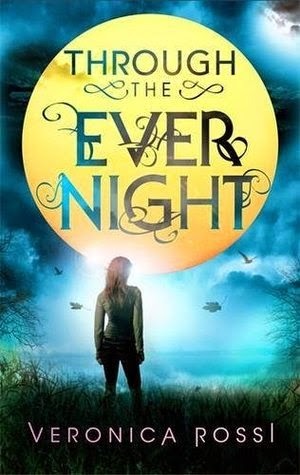 Through the Ever Night by Veronica Rossi is the second book in the trilogy which started with Under the Never Sky. That book introduced us to this world and these characters. I remember absolutely loving Under the Never Sky when I read it several years ago. It felt addictive and emotional and incredibly exciting. Unfortunately for me, that same level of emotion and excitement wasn't quite there when I was reading this sequel. I could see that there were lots of several very tense scenes, lots of people being reunited and being separated but I couldn't quite bring myself to feel very much about these comings and goings. And I can't quite put my finger on if it's the writing style that let me down or if it's just the huge gap in time between reading the first book in the series and this book? The following review will have minor spoilers for the first book in the series, Under the Never Sky, but will not contain any spoilers for Through the Ever Night. If you have not yet read Under the Never Sky and would like to, I would suggest not reading any further! Through the Ever Night takes place directly after the ending of Under the Never Sky and Perry and Aria are reunited after the explosive events of Under the Never Sky. Perry is now the Blood Lord of The Tides and Aria is being blackmailed by Hess to find the location of the Still Blue with Talon, Perry's nephew, being used as leverage. Perry and Aria are determined to stay together and work with each other to find the Still Blue in order to save Talon but also to save The Tides. But what neither of them realise is how much things have changed. Especially for Perry who now have hundreds of people depending on him to lead them into safety. Because things aren't great for them right now. They're facing starvation and uncertainty with the Aether throwing down storms that threaten their very existence. And while Perry might have thought the hard work was done when he became Blood Lord, it's actually a lot more complicated as he must earn the respect of those he's leading. And none of them are all that keen to accept Aria as one of them. What I found interesting about this book is that the challenges that are placed upon Perry and Aria help each of them to see that it might be better to be with other people - other people who share their special gift, or other people who would be more acceptable to their families and communities. These things, I thought, helped them both to see that love is hard and that it's going to be difficult but that they what's important is the choosing to be with someone during the good times and the bad. A lot happens during Through the Ever Night. There are lots of new twists and alliances made and I thought it was an interesting second book in this trilogy. I'm hoping to read the third book very soon as I'd love to know how this story will end and I hope the best for these very intriguing characters! Yes, I love Roar and Aria together, they're wonderful. I've since read book 3 and loved it so I can only assume my lackluster feelings for this book were down to the length of time between reading book 1 and 2!